DISCLAIMER: I am not a professional carpenter, woodworker, or crown molding hanger. 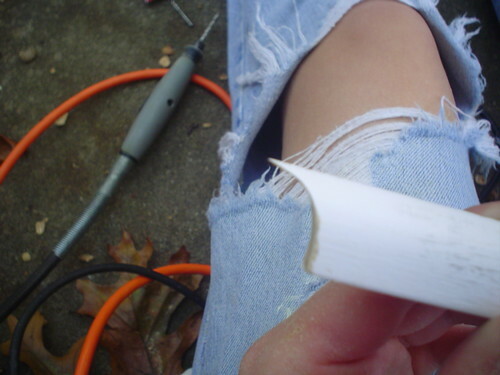 I’m just a girl with a dremmel, some rotozip bits, and a miter saw. I’m not even going to pretend like crown molding is my friend. I live in an eighty year old crooked house. Anything that needs to be straight, level, cut at a specific angle, or must be hung in the presence of polite company (aka without swearing) is not welcome here. 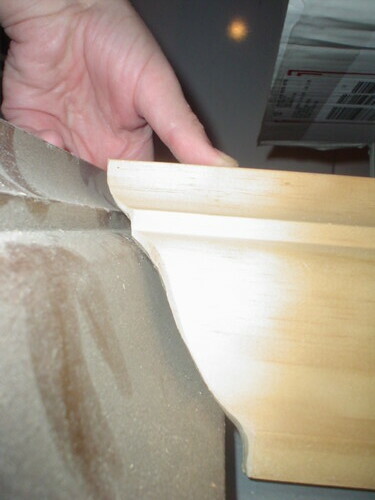 And that’s why coping crown molding joints and the like has been such a huge part of life on garrison road. Because the only way those little plastic miter boxes where you saw everything a a flat angle work is in a world where houses are perfectly square. And maybe not even then. 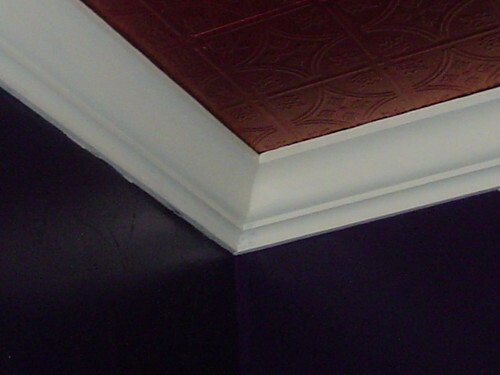 So, for someone who has never had to cope a joint before before, I’ll start with the shoe molding I had to put on in The Purple Bedroom because the concept is easier when you aren’t dealing with all those funky crown molding angles. 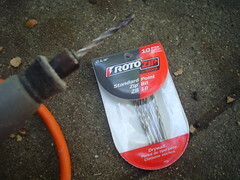 A cheap Black & Decker dremmel type tool with a flex shaft attachment (my favorite tool in my arsenal) and some rotozip bits. No angles, nothing tricky. 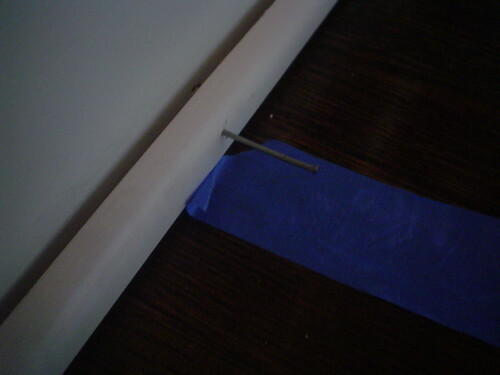 My personal trick for not beating the brand new floor up with the hammer while nailing this stuff in: Painters tape. 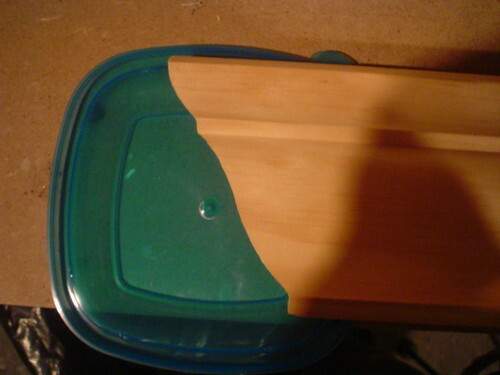 Incidently, the first to pieces of trim/molding etc. will go on opposite walls, which is probably obvious. 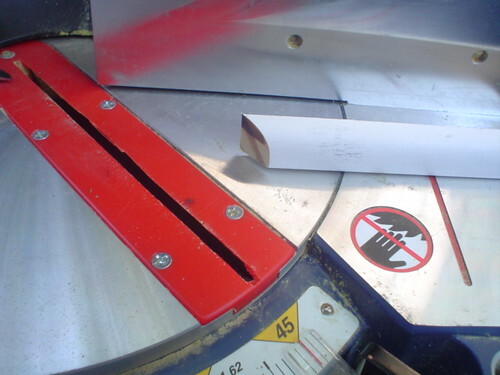 Step 3: Cut stuff with the big saw. 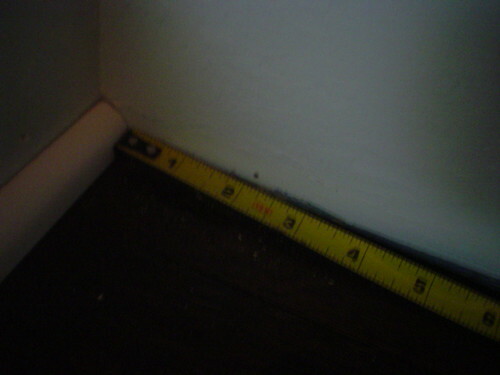 For shoe molding or baseboard or anything that sits flat against the wall, you’ll cut it at a 45. One of the reasons that I love this saw so much is that it does the math for me. The objective is to cut this out so that these two pieces fit together nicely. That’s where the dremmel comes in. 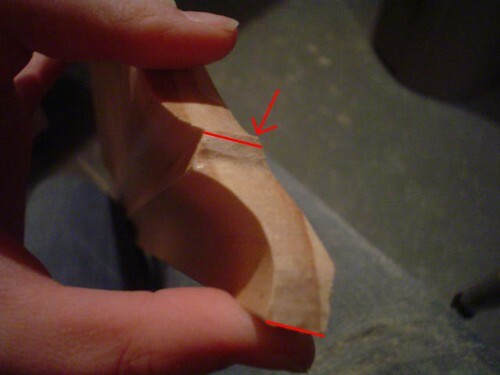 The whole point of cutting that piece at an angle instead of just hacking at it with a saw was to create a line that I can use to know what part of the wood needs to be carved out. People do this by hand with coping saws or with their jig saws set at an angle, but personally I’m more comfortable with my dremmel. This takes about 1/16″ to 1/8″ of wood away each time I swipe it over (almost like an electric knife) depending on how hard I push. 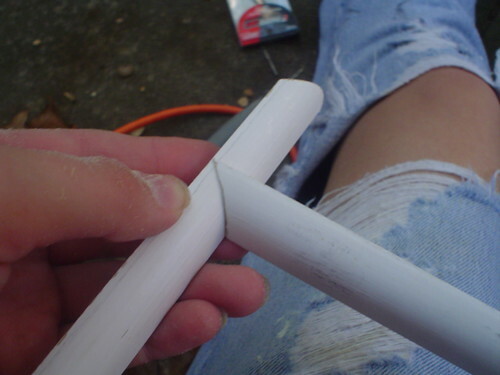 It definitely takes getting the hang of, but this is how I carve my brooms, so I’ve had some practice. Then you just pop those babies in, and voila! Finished shoe molding. Crown molding, on the other hand, is a little more difficult. The nice thing is that the saw pretty much does the angles for you, and it’s not as fragile on the ends as the shoe molding (and that sharp little point). 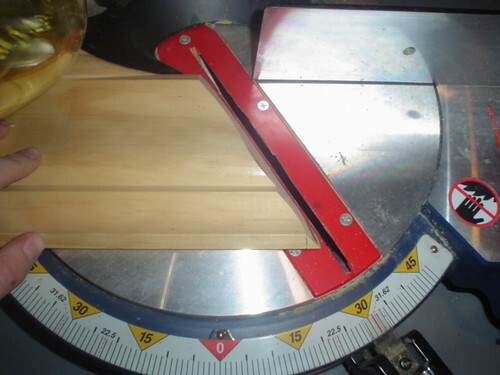 The saw has markings at 31.62 degrees, and 33.9 degrees, so that’s where I cut. 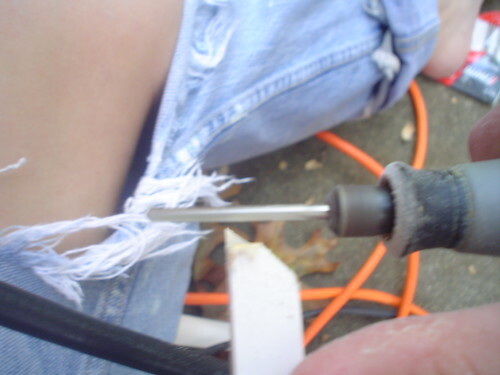 I’ve learned to trust the saw. Technically the part of the molding that is on top in that picture will be on the bottom when you actually install it, which makes sense if you try to visualize… it was just easier to hold that way. I was having a little trouble getting a tight fit, so I added some lines to this picture so you can see where I needed to trim. 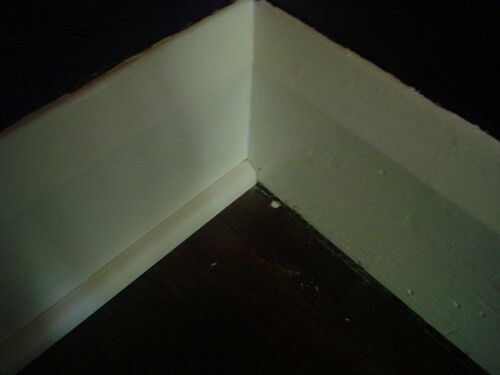 That ridge in the middle should be parallel with the bottom of the molding. 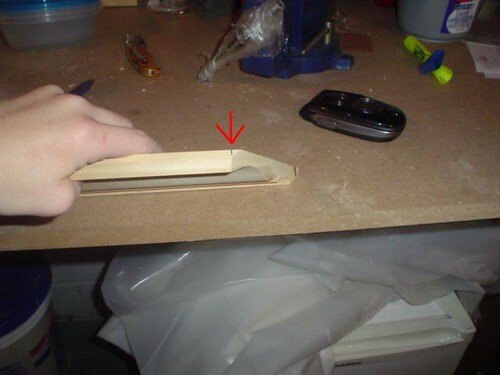 And is much more forgiving in a crooked room than just cutting the joint at an angle would be. 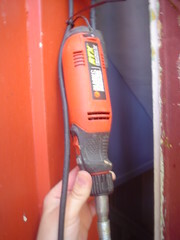 holy crap you are a dremmel wielding wonder! we want crown molding but are a’scared to attempt it. we envision so much cussing and throwing of anything we can get our pissed off hands on. but….i will be back to study this. We are considering the Armstrong faux tin ceilings for our kitchen. 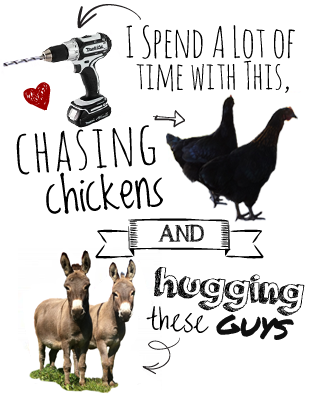 How are you liking yours? 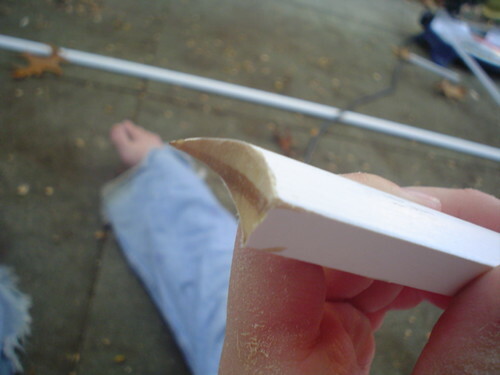 Did you nail or use adhesive? Any tips would be appreciated! Thanks for the kudos and the tips! I kinda wondered about the tiles “flopping”, but the only other alternative we have is spending 2 grand on real tin tile and having to nail it down. As our ceiling is the original plasterwork from 1921, nailing into it causes more problems than its worth. Now I’ve just got to come to a conclusion as to what color I’m going to paint the damn thing………. The floor is going down this weekend and the island, lighting, and countertops should be finished by the end of February. After that, its on to the tiki/diningroom. Mostly just a good paint job and hanging the tiffany pendant light we purchased. The big job is after that, when we tackle knocking out a wall and expanding our bathroom on the second floor….. Thanks for the great tips on cutting the crown molding. PS great legs. Thanks for the dremmel tip on the moldings. Defintely great legs. More pics of them, not wood! Keep on keeping on. Great site. According to this site the crown is installed correctly. Hi there, you are a lady after my own heart. I enjoy doing projects around my house myself (sorry contractors) and just like you … in my barefeet. 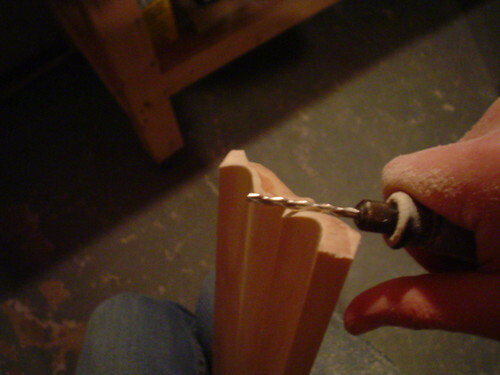 I hate coping with a coping saw, my hands don’t have the strength. I tried using a dremmel, but I think I’m missing a step. 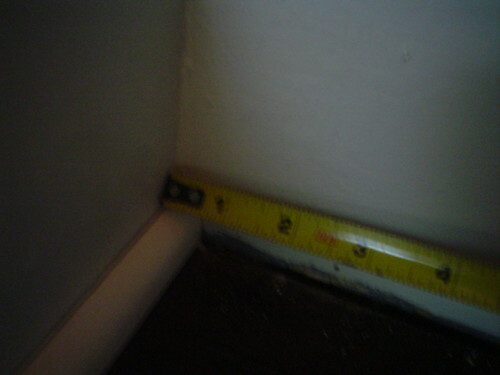 I’m using 9/16th x 1-5/8th crown molding at 45 degee on top of the baseboard. I didn’t want to miter the inside cut, so I thought I would give coping a try. We’ll after several tries, I just cannot cope! (This is where I miss my Dad, he was a great teacher). The part I am having problems visionalizing on your demonstration is when you cut the crown molding on the compound saw with markings at 31.62 degrees, and 33.9 degrees, obviously that is an inside cut? (For 45 degree crown, my settings would be 35.26/30.00). 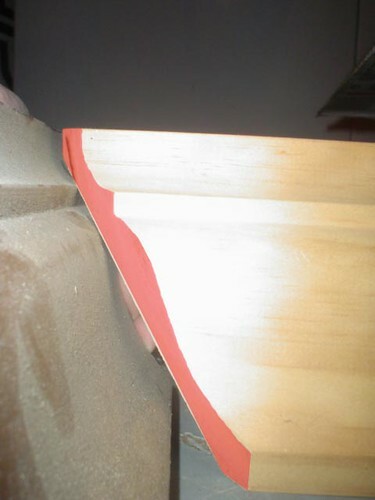 The next step you show the piece of wood with the part that needs to be removed in red. In this picture, the cut looks like a straight 45 degree cut. 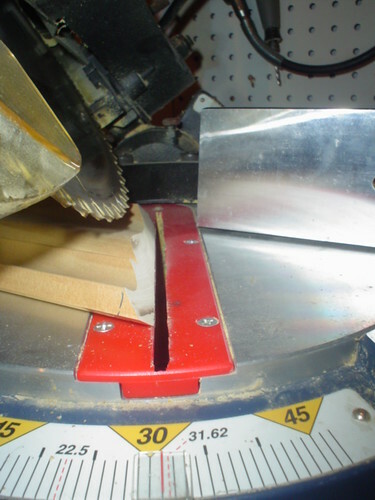 This is where I got lost, did you remove the excess wood by using the miter saw before coping? Your help is appreciated before I pull my hair out and give up. I determined to learn. Why did you install the crown moulding upside down? When holding the two pieces together to show the cope cut…you inadvertantly cut them the wrong way…upside down. With all due respect, the last picture with the tin ceiling….in that picture the crown is installed upside down. The second last picture…..where you show the finished fit,is ultimately the way the finished product should sit on the walls and ceiling…with all that detail topside against the ceiling portion. While the fit is absolutely perfect in the second last picture….notice the angle of the other piece..it’s not an inside corner. Again,please don’t take this as criticism…I’m simply pointing this out based on 25 years experience as a finish carpenter and joiner. I checked the two links you provided. It can be a bit confusing since there are so many different profiles out there. There’s a little double confusion here! 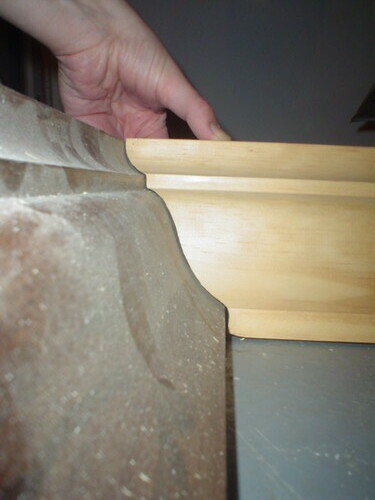 While I completely agree that its virtually impossible to hold two pieces of moulding together and take a picture at the same time………………in fact you’re not holding it upside down….but rather right side up. That being the case……..the cut in the picture is incorrect since it’s not an inside corner. I can absolutely assure you you installed the moulding upside down. Show a piece to a finish carpenter and he will tell you. 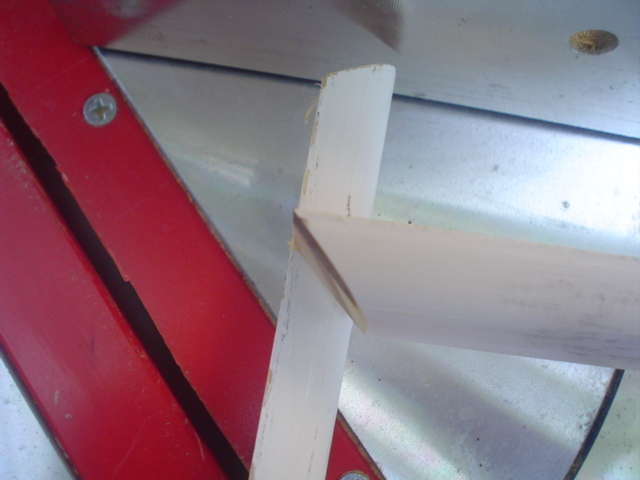 If I’m incorrect, I will buy you a brand new compound miter saw with a laser. That is a promise from an Irish gentleman. <a href=”http://www.invitinghome.com/Crown_Molding/Mouldings_Enter.htm”.Crown molding can give your home a lot of character and for someone who claims they have little experience, you did a great job! Impressive! 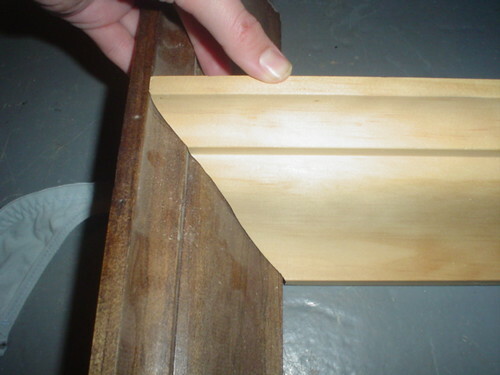 Great crown moldings and nice step-by-step. Looks like it requires a lot of patience. Your clear instruction almost makes me feel brave enough to attempt myself. 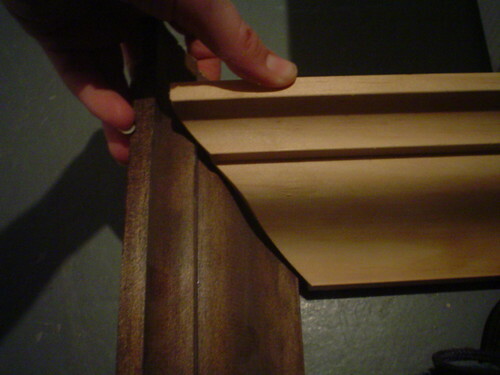 So is the mystery of the right-side up/down crown moulding solved? I’m not really a professional finishing carpenter, but I think you got it correctly based on the crown moulding photo gallery that I’m currently viewing. Not sure though about inside corners so I might be wrong. As the gentleman has said, there are lots of profiles out there so we can never be sure about how a piece was originally intended to be installed. My front door was made out of oak, but I dunno if that is the best material, does anyone know what is the best material for front doors? Just passing by to comment you for the great read. It was really worth my time reading this content. Waiting for more wonderful posts soon! I added your feed in my reader! This will be my new fav place online!! Thanks! Thanks for this! My mom and I are putting up crown molding in the kitchen of her 1850’s farmhouse – not a straight wall in sight. This will make things look a little less hacked up. My blog is in the very same niche as yours and my users would really benefit from some of the information you provide here. 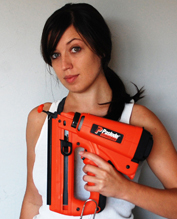 Has the Irish gentleman provided you with that laser compound miter saw yet? You installed that contour of crown correctly. Great tutorial! Link Robot Express shall conserve thousands on PPC Search! This is the ritht web site ffor anybody who hopes to find out about this topic. You know so much its almost hard too argue with you (not that I personally will need to…HaHa). Mr Hart has also called on other contributors to the service to our country. whether they want a more prominent lawyer who may have a job to defend their parents. For example, you may have to reverse his ruling. In this situation, you will need to complete parenting classes.